Mentoring class was given to 32 entrepreneurs in Menteng Sub-district, Central Jakarta. In this class, entrepreneurs will be assisted until they obtain Small Micro Business Permit (IUMK). This mentoring is included in Integrated Entrepreneurship Development (PKT) training program.
" IUMK is important for us because it is required to apply for capital loan in Bank DKI"
Melinda (42) one of the entrepreneurs said, the mentors assisted her to apply for IUMK. "IUMK is important for us because it is required to apply for capital loan in Bank DKI," she conveyed after mentoring at Amir Hamzah Children-Friendly Integrated Public Space (RPTRA), Monday (3/25). Another participant, Hera (35) explained that her side was taught about procedures to apply for capital loan in Bank DKI, such as to create financial report, business needs, and other required documents. 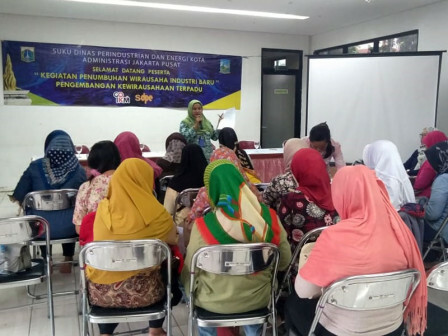 Central Jakarta Industry and Energy (PE) Sub-department personnel who are responsible for PKT program said, mentors also assist entrepreneurs who want to obtain halal certification. "We are committed to assist new entrepreneurs in Central Jakarta to develop thei r business," he asserted.